Nope, not a comedy club. 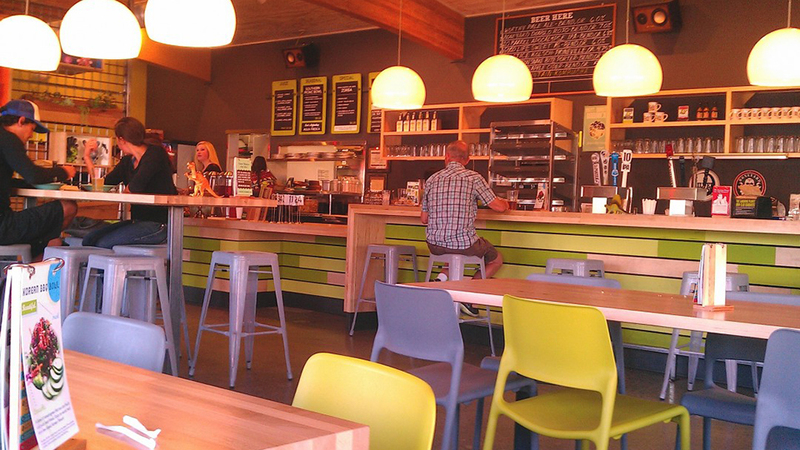 Just a Northwest-based restaurant that’s serving up healthy fast(ish) food with a healthy dose of fun. Laughing Planet Café was inspired by the notion that food should get from the farms to your plate as quickly as possible, and in the least complicated way. And by farms, they mean ones that are in the same time zone as their restaurants. Clean, whole foods, tons of fresh veggies, and surprising global flavors make all the food delicious and keeping things local keeps the whole operation super sustainable. Even their salt comes from Oregon. Tasty burritos and bowls, soups, and salads, are made to order in flavor profiles like Thai, Mexican, Indian, and Korean. Smoothies and juices are also on the menu and, of course, made on the spot. The Bend Laughing Planet is on 3rd Street, just off Greenwood and is open daily from 11:00 a.m.-9:00 p.m. The airy, relaxed atmosphere is perfect for families with young kids and a patio tucked on the side of the café is a great place to enjoy the sun (and a laugh, of course) while you enjoy your meal.